of furniture grade solid wood bases and real UV protected glass. The base & back are also mirrored so you can see the entire doll. Includes 1 free nampelate. Additional nameplates are available for $2.00 each. 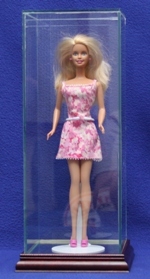 Single barbie doll size glass display case with choice of hardwood base mouldings & mirrored floor. Features optically clear UV protected glass. Choice of clear or mirrored back panel. investment in the protection of your memorabilia collection. Includes 1 free nameplate. Interior case dimensions are 5"L x 5"W x 13"H.
We do custom sizes, Just Ask! Single barbie doll size acrylic display case with a solid walnut wood base. investment in the protection of your doll collection. Includes 1 free nameplate. Interior case dimensions are 6"L x 6"W x 13"H.